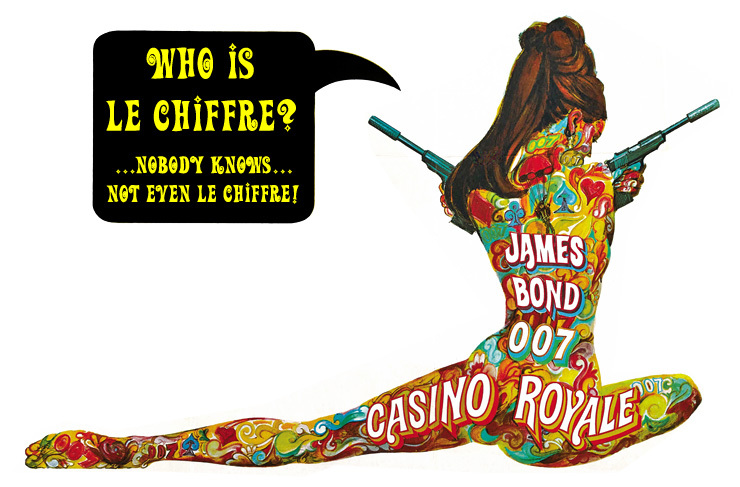 To celebrate the 50th Anniversary of the release of Casino Royale, 007 MAGAZINE’s Webmaster Kevin Harper presents 007 little-known facts about the film that was too big for one James Bond! 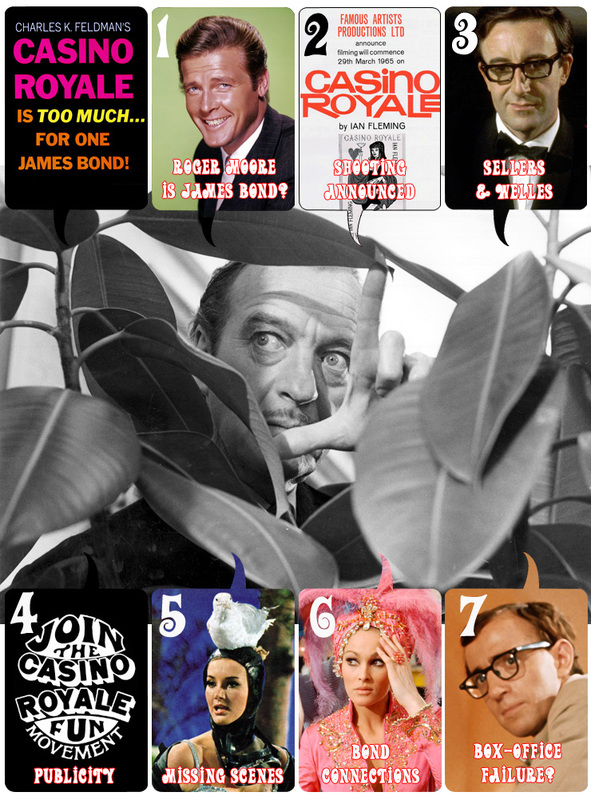 Casino Royale (1967) is a bit like Marmite - you either love it or loathe it! To many Bond fans the film is an embarrassment and totally dismissed because ‘it isn't really a Bond film’, but many of these same people will happily accept Never Say Never Again into the canon because it stars Sean Connery, and because it was a so-called 'serious' attempt at making a Bond film outside of the official EON series. Let's face it, Casino Royale shouldn't be taken seriously, because it's a comedy, but given the choice I'd still watch it any day in preference to the ill-conceived Connery comeback! The story behind how the 1967 version of Ian Fleming's first James Bond novel was made would make a fascinating film in itself, and the many behind-the-scenes stories surrounding its troubled production have since become legend. 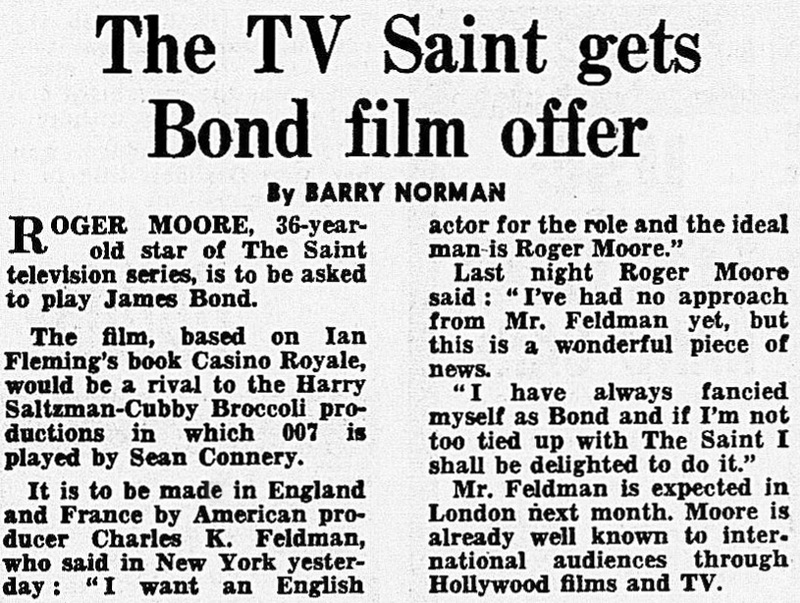 In June 1964 the Daily Mail speculated that Roger Moore would be cast as James Bond - a month before he actually played the character for the first time in a comedy sketch as part of the UK television show Mainly Millicent. Pre-production problems resulted in Casino Royale finally going before the cameras in February 1966 - almost a year after shooting was actually announced in trade magazines. Shirley MacLaine was originally announced as one of the stars in September 1965, alongside Peter Sellers and Terence Cooper. The final script is credited to Wolf Mankowitz (who wrote an early version of the script for Dr. No in 1961), John Law and Michael Sayers, although a number of uncredited writers also contributed material; among these were Ben Hecht, Billy Wilder, Woody Allen, Terry Southern, and Orson Welles. When shooting finally began at Shepperton Studios there were rumours of a rift between co-stars Peter Sellers and Orson Welles that perpetuates to this day. Production stills prove that the two actors did appear on set together, and much of what they shot does appear in the finished film. The disjointed production schedule was rearranged daily to suit the availability of many high-profile guest stars who were brought in at the last minute by producer Charles K. Feldman. The teaser trailer highlighted the appearance of two star players whose performances are little more than a cameo, as they only have a few seconds of actual screen time in the finished film. Filming began in February 1966 with director Joseph McGrath, who was eventually dismissed from the production on the instructions of Peter Sellers (who ironically would be dismissed from the production himself in May 1966). Robert Parrish then took over from the end of February until late April 1966 with his work on the film being confined to Shepperton Studios. Celebrated American director John Huston shot at Pinewood Studios in April and June 1966, with additional location shooting in Ireland. Huston's segment included the grouse-shooting sequence and exteriors at Killeen Castle (doubling as Castle McTarry) with Deborah Kerr and David Niven. John Huston also played 'M' after the original choice Robert Morley was unavailable. 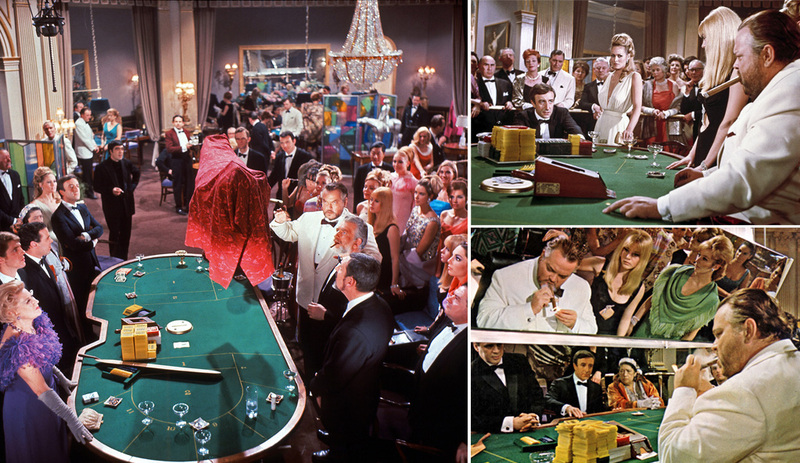 Back at Shepperton Studios American director and stuntman Richard Talmadge shot the action sequences on the casino set from May to July 1966. Val Guest was brought in to make sense of the whole production, and shot linking scenes with the main cast who were now joined by Woody Allen, who was originally hired just as a screenwriter. Val Guest also worked at MGM studios during September 1966, where Kenneth Hughes was shooting the Berlin segment. Val Guest finally finished special effects shooting and pick-up shots in October 1966. ABOVE: (left) Deborah Kerr (watched by co-star David Niven) rehearses a scene from Casino Royale with director John Huston on location in Ireland. (right) Original director Joseph McGrath with Peter Sellers and Jacqueline Bisset (playing Miss Goodthighs) at Shepperton Studios in 1966. Both director and star would be dismissed from the film. The resultant film was released on an unsuspecting British public following it's Royal Charity premiere on 13 April 1967. Despite some poor reviews in the British press, the film went on to do brisk business at the Odeon Leicester Square in the weeks before Sean Connery's fifth 007 outing You Only Live Twice opened there. 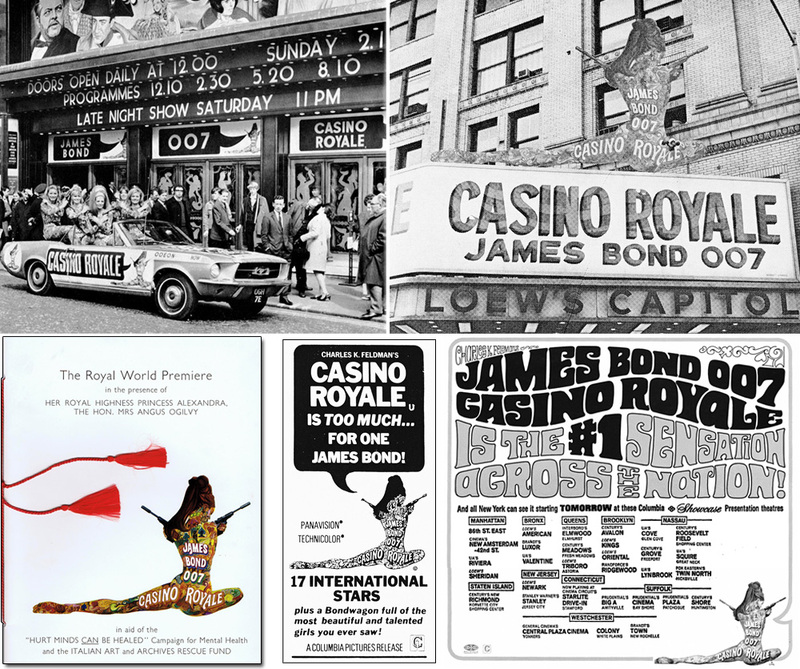 Casino Royale opened at the LOEW'S Capitol Theatre in New York on 28 April 1967, and for six weeks it was the highest-grossing film in the United States. 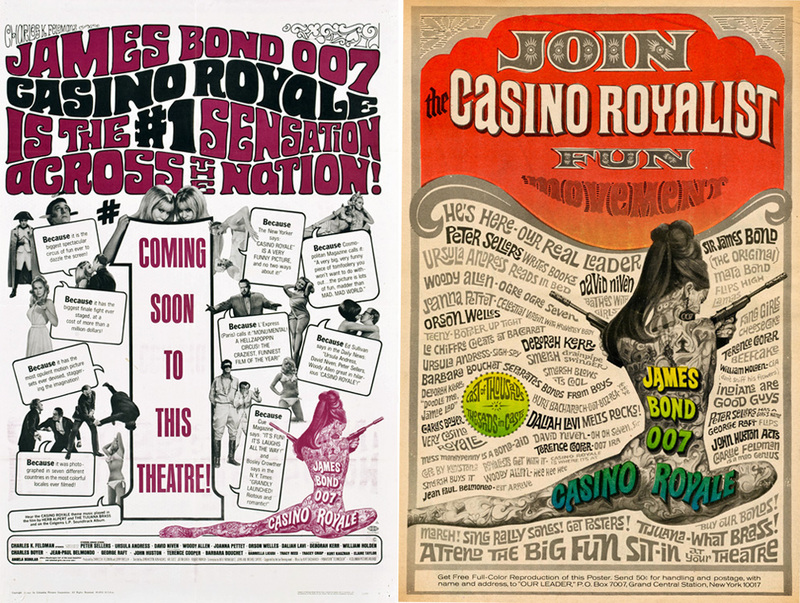 Eventually becoming the thirteenth most successful film of 1967, the myth that Casino Royale was a box-office failure still attaches itself to the production, as it later would to On Her Majesty's Secret Service. Both films were hugely successful on their original release, and it is only because of poor reviews and mis-reporting at the time, that these untruths perpetuated in the media until publications like 007 MAGAZINE eventually set the record straight. 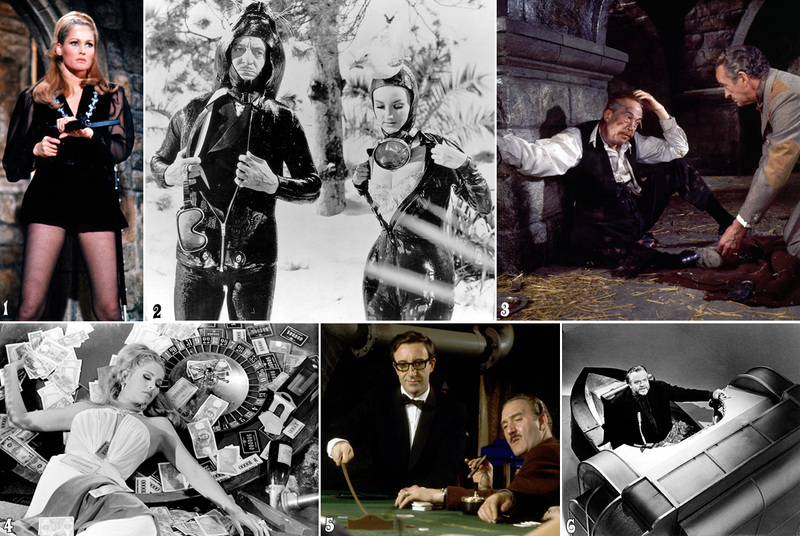 Not surprisingly, many scenes were shot by Casino Royale's five directors that never made it into the finished film. Tantalising glimpses of these appear in Richard Williams' clever main-title sequence and in the many publicity stills that have surfaced over the years. Orson Welles later attributed much of the film’s success to the advertising campaign featuring a naked tattooed lady, painted by long-time Bond poster artist Robert McGinnis. 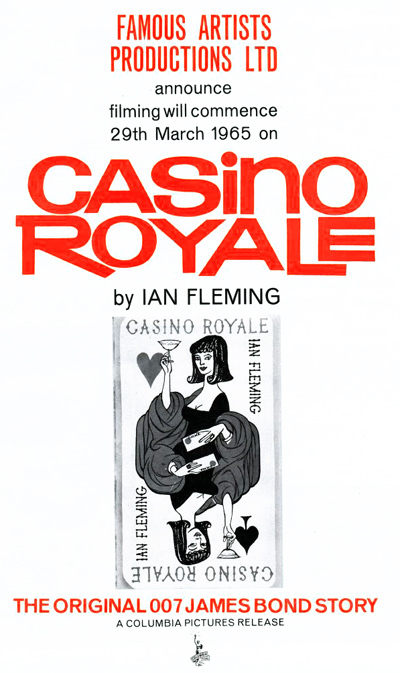 Despite not being part of the official James Bond series, Casino Royale featured performances by many actors and actresses who had already appeared in earlier EON produced films, and others who would go on to do so in later years. Loved and reviled in equal measure, Casino Royale remains very much a product of its time and boasts some of the most incredible talent ever assembled for one film, both in front of and behind the camera. Its soundtrack by Burt Bacharach has probably stood the test of time more than any other element, and for years the original vinyl record pressing was considered the absolute pinnacle of recording excellence in the pre-digital era. Re-released many times since 1967, the soundtrack along with Dusty Springfield's recording of The Look of Love, is absolute perfection. Its sell-out status is a tribute to the quality, both aurally and aesthetically, of Bacharach's iconic Oscar and Grammy nominated score. 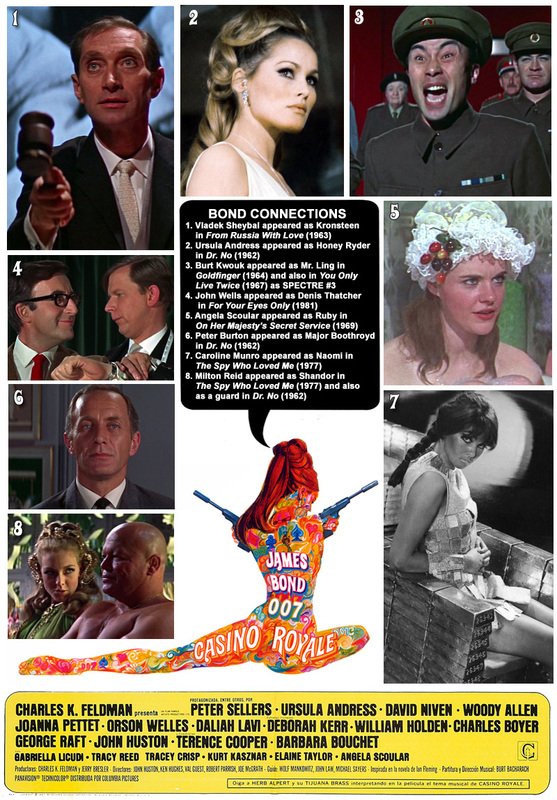 Casino Royale's legacy stands apart from other James Bond films. Many viewers dismiss it outright because it is not part of the official series, being essentially a spoof of the whole sixties spy genre. Mike Myer's Austin Powers films are probably more influenced by Casino Royale than the official Bond films starring Sean Connery. 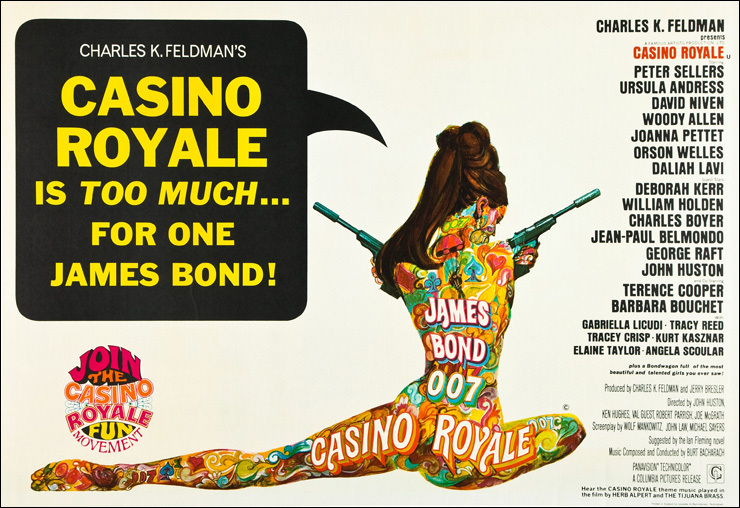 Released at the tail-end of the spy boom, Casino Royale can be viewed alongside the Derek Flint and Matt Helm spoofs as very much a product of its time, and in many respects it has dated far more than many other films made in the same period. That we are still watching and writing about it 50 years after its original release is a testament to its appeal. Like it or loathe it, Casino Royale is STILL too much for one James Bond!